Since 2007, I’ve had the privilege of meeting 800 new friends through a project that has been a platform for joy and connection in 14 cities nationwide. Beach balls, car tires, the Chicago Bull, a Texas longhorn — all have graced the stage in Bolero. The Bolero project has cultivated a community, linked by their experience as a part of the creative process. As I crisscrossed the country, a visit to my parents’ retirement community provided time by the pool, and as I observed the vibrant scene unfolding, the kernel for BOLERO BOCA was born. This year, KEIGWIN + COMPANY will take a leap and translate the magic of Bolero to film with BOLERO BOCA and we need your help. 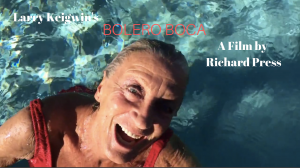 A poignant exploration of aging and community, BOLERO BOCA is a story about 50 seniors who come together to create a dance. Not your average dance, but a water ballet — Busby Berkeley meets modern dance with a twist. The film, directed by award-winning filmmaker Richard Press (Bill Cunningham New York) will follow the seniors as we create the dance and explore their lives, culminating in the water ballet and a joyous celebration of actively aging, set to the iconic score of Bolero by Maurice Ravel. I invite you to be a part of BOLERO BOCA by making a year-end gift. Bolero has taught me the power of community and the impact of participating in art-making. Together with Richard and the BOLERO BOCA team, we look forward to celebrating creativity and vitality at any age. I ask you to make a gift so K+C can embark on this thrilling endeavor and bring the story of this wonderful community to the screen. Thank you for being a part of the K+C family. The AmazonSmile Foundation will donate 0.5% of the price of eligible purchases to the charitable organizations selected by customers and this link will allow you to choose us. You can now take part in helping KEIGWIN + COMPANY by simply shopping online.